Litter decay rates are often correlated with the initial lignin:N or lignin:cellulose content of litter, suggesting that interactions between lignin and more labile compounds are important controls over litter decomposition. The chemical composition of lignin may influence these interactions, if lignin physically or chemically protects labile components from microbial attack. We tested the effect of lignin chemical composition on litter decay in the field during a year-long litterbag study using the model system Arabidopsis thaliana. Three Arabidopsis plant types were used, including one with high amounts of guaiacyl-type lignin, one with high aldehyde- and p-hydroxyphenyl-type lignin, and a wild type control with high syringyl-type lignin. The high aldehyde litter lost significantly more mass than the other plant types, due to greater losses of cellulose, hemicellulose, and N. Aldehyde-rich lignins and p-hydroxyphenyl-type lignins have low levels of cross-linking between lignins and polysaccharides, supporting the hypothesis that chemical protection of labile polysaccharides and N is a mechanism by which lignin controls total litter decay rates. 2D NMR of litters showed that lignin losses were associated with the ratio of guaiacyl-to-p-hydroxyphenyl units in lignin, because these units polymerize to form different amounts of labile- and recalcitrant-linkages within the lignin polymer. 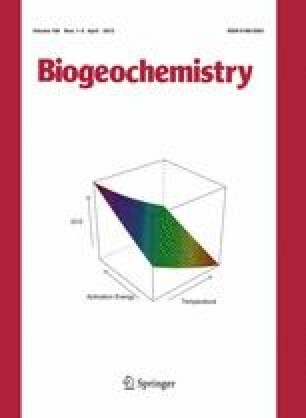 Different controls over lignin decay and polysaccharide and N decay may explain why lignin:N and lignin:cellulose ratios can be better predictors of decay rates than lignin content alone. We thank Steven Allison, Donovan German, Stephanie Kivlin, Matthew Whiteside, Sandra Dooley, Heather McGray, Marko Spasojevic, and Rebecca Aicher for their critical review and support of this work. We also thank Dr. Philip Dennison and the UCI NMR Facility for instrument and software support for this research. Dr. Lise Jouanin and Dr. Clint Chapple generously supplied seeds of Arabidopsis plants used in this experiment. NSF-EAR-044548, a UCI Environment Institute Research Grant, and a Graduate Research Fellowship from NSF supported this project.